More than 100,000 people visit NFC World every month to track the latest developments in the market and we now have close to 10,000 members of our NFC World Knowledge Centre — 69% are management level and above, 24% work in banks and financial institutions and more than half work for large companies. One-third of our readers are in the Americas, one-third in Europe and one-third in Asia Pacific and beyond. 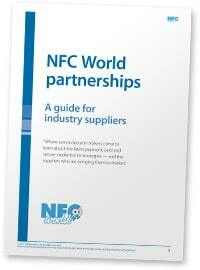 “NFC World partnerships — A guide for industry suppliers” includes details of the backgrounds and seniority of our audience and explains how we work with our partners to educate our readers on the latest trends and technologies. The guide also includes full details of the benefits available to industry suppliers who join NFC World’s Partner Program and how membership helps payments, card and secure credential suppliers build awareness, showcase thought and technical leadership and generate leads — all year round. This guide has been produced and is sponsored by NFC World. This 12-page document is available free of charge to NFC World Knowledge Centre members (PDF format, 2MB).